Richard Haughton James, aka Jimmy James, is a legendary figure in the history of Australian design, not so much for his design and advertising work as for his promotion of design as a modern creative industry with its own practice and codes of behaviours, ethics and standards and a defining critical discourse. A founding member of the Design and Industries Association of Australia, DIAA, 1939, and a founding member and first President of the Australian Society of Designers for Industry, SDI, 1948, James was a talented master of the media who used radio, exhibitions, public speaking, publicity and writing to run public awareness campaigns for design, in the process setting the critical and defining discourse about the role of the designer in Australian society. 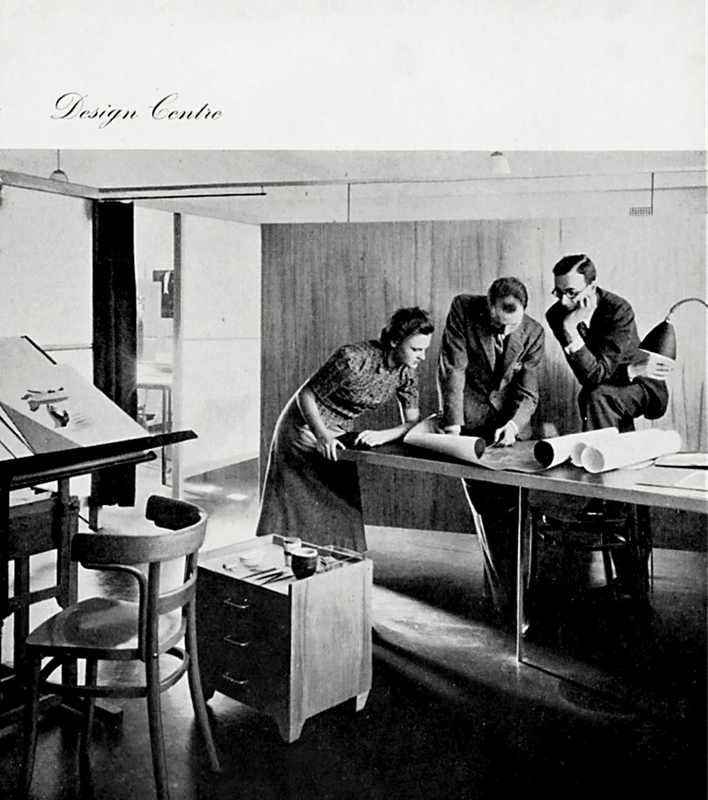 Promotion for the Design Centre, 1939. Photograph by Dahl and Geoffrey Collings. Within modernist historiography, Haughton James’ speedy rise to prominence could be attributed to the aura of authenticity that accompanies the migration of a designer who experienced the real thing to the colonial margins. But James was not an unknown within Sydney’s contemporary art and design scene. Quite the contrary, before coming to Australia, James had made his mark as an Art Director and design publicist in London in the heady days of the 1930s when modern advertising and the concept of Art and Industry was coming into its own. This was the era of Edward Mc Knight Kauffer, of the Shell Posters, Underground and the LNER campaigns, when design was beginning to be professionalised and design societies established, and enlightened businessmen and cultural figures were joining with designers in promoting the new ideal of Art and Industry. Emergent modern designers were being praised for democratising art, with exhibitions of their ‘commercial art’ being held at leading London galleries, while writers such as Herbert Read, John Gloag, Arthur Bertram and Laszlo Moholy-Nagy amongst others, were beginning to theorise the principles and practices of modern ‘industrial’ design 3. At the grass roots level, a plethora of trade journals and publications including Commercial Art provided the how-to information and instructions for the everyday practice of modern design. James, like many of his era, rejected the option of a university education to join the new creative industries, preferring instead to learn design on the job while attending art school at night. He began working in print workshops before moving into commercial art, freelancing and becoming an art director with the London branches of the American advertising agencies, Erwin Wasey and Co. and H K Mc Cann and Co. James appears to have been a natural entrepreneur, using his British private school education and cultured family background to great effect to position himself as a new styled, cultured businessman who was able to create crossovers between industry, business, advertising and the commercial arts. 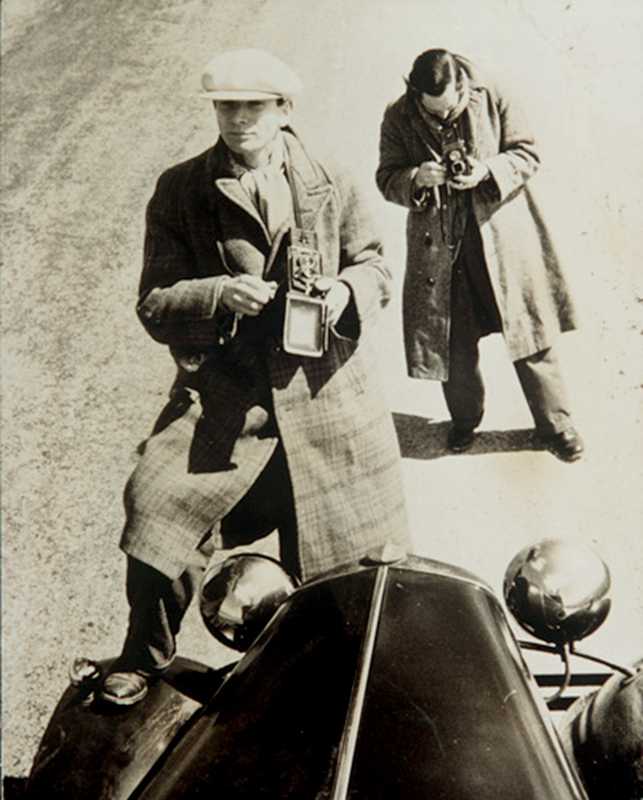 He established the London School of Advertising in 1927 and organised the first International exhibition of Modern Photography at the Wertheim Galleries, London in 1933. A council member of Society of Industrial Artists (1930), he drafted their Code of Fair Practice in 1935 and began promoting the need for design standards through media interviews, lectures and journalism 4. Within his writings, James expressed British reservations about modernism arguing in one that ‘contemporary’ design, ‘meaning designing for people living today’ was less misleading. Published in Art and Industry, Industrial Art, Advertising Monthly, his articles called for standards in packaging, graphics, advertising and lettering, and promoted emerging designers including the Australian couple, Dahl and Geoffrey Collings, who were making their mark in England. Geoffrey Collings and Gordon Andrews, c. 1930s. James met the Collings at Wasey and Co, and was well known to the contingency of Australians working in London, including Alistair Morrison, Elaine Haxton and Gordon Andrews, and the architect, Syd Ancher, with whom he roomed 5. Geoffrey Collings was working for Wasey; Dahl and Alistair Morrison with Moholy Nagy on the Simpson Department Store, Piccadilly, the first holistic application of Bauhaus/Constructivist principles to a large-scale commercial project. The Collings’, in particular, were attracting critical acclaim for their documentary film work, and their joint exhibition with Morrison, Three Australians, at Lund Humphries Gallery, in June/July 1938. James passage to Sydney followed the path of the Collings’ return home via Tahiti in late I938. He no doubt knew of Sydney’s thriving commercial art and advertising design scene that had been forming under the patronage of Ure Smith and Lloyd Jones. When he arrived in Australia, interest in modernist architecture and design was high, partly due to the return of artists and designers from working overseas. But the enthusiasm for the reforming potential of modern design had been growing throughout the 1930s, as part of the post depression recovery and this, together with expanding employment opportunities, had led to the formation of Australian Commercial and Industrial Artists Association, ACIAA, in Melbourne in mid 1939. With the spectre of WWII promising to cut Australian market dependency on Commonwealth imports, national leaders were turning their attention to manufacturing for the war effort and the home market and, with this, design as a new form of expertise. By late 1939, the consensus was that Design was going to be important to the war effort and recovery, and thus it was important to begin educating and debating standards in design and manufacturing, as Lady Dugan explained to the audience at the opening of the ACIAA’s first annual exhibition in June 1940. With work plentiful, James took up a position at J Walter Thompson, and turned his attention to becoming a publicist for the emergent Australian design industry, drawing on his English experience to give credibility to his arguments. Joining with the Collings, he set up the Design Centre, Australia’s first, if somewhat short-lived, professional design studio, specialising in packaging, product design, photography, documentaries, modern publicity, advertising and art direction. Located close to Ure Smith’s offices, its opening was featured in the first edition of the Australia National Journal when published in late 1939. The Design Centre was significant in many ways, not the least of which was that it provided the model of practice for the new Design and Industries Association of Australia, DIAA, that Ure Smith, Lloyd Jones and James had been working to established with the patronage of influential figures, including the Prime Minister, Robert Menzies, the newspaper baron Keith Murdoch, Ernst Fisk, Harold Clapp and Russell Grimwade. Emergent designers were grouped in with trades such as lithographers, engineers or draftsmen and employed without codes of practice including basic award wages. 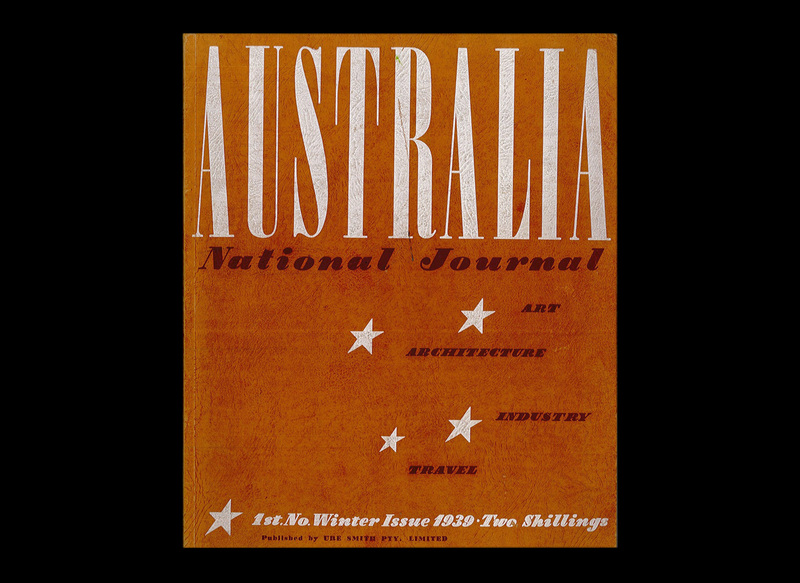 The publication of Australia National Journal coincided with the onset of war, and this brought a premature end to the Design Centre and the DIAA, as James and his contemporaries were swept up in the war effort. James joined the AIF, and worked in camouflage before moving into propaganda, where he assisted the government’s advertising for war effort, producing poster campaigns for war bonds, and publications for the Australian Army Education department on the role of art and design in shaping the everyday.12 Discharged from the defence forces in 1945, James settled in Melbourne, establishing the industrial design firm, Haughton James Services in 1946 and employing Max Forbes and Arthur Leydin. He joined forces with Fred Ward, Peter Hutchinson, Victor Greenhalgh, Alan Warren, Max Forbes, Ron Rosenfeldt, Frances Burke, Gordon Andrews and Grant Featherston amongst others, and once again began campaigning for the professionalization of design, beginning with the establishment of the Society of Designers for Industry, SDI, in 1948. In late 1949 he played a pivotal role in designing and organizing, the ‘Yesterday, Today and Tomorrow’, Red Cross Modern Home Exhibition in Melbourne, ensuring that it was an promotional showcase for SDI and the idea of an independent, design profession dedicated to the shaping everyday Australian life. In 1952 joined John Briggs in establishing Briggs and James, Australia’s first really solid advertising agency. This essay was sourced from The Design History Australia Research Network [DHARN].